When you buy today, you not only get the MAX Workouts 90-Day Program, you also get all 3 bonuses shown below (a value of $89.85) for FREE. During this limited-time offer, you get this entire package for a one-time payment of only $39.95! 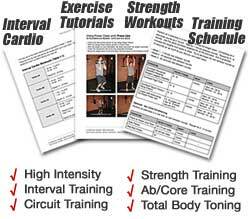 Burn more fat and build lean muscle with the #1 accelerated fitness & fat burning program. In just 90 days you'll get lean and ripped using a combination of high intensity, interval, strength, and circuit workouts designed to get you the best all-around, full body fitness. 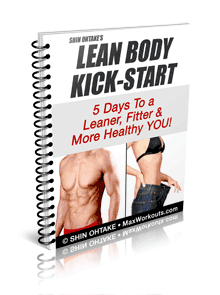 Follow along with the over 40 step-by-step exercise photos and the 90-day workout schedule and you'll start melting away fat and sculpting lean, defined muscle while skyrocketing your energy levels -- all in less than 30 minutes a day. This book is 120 pages in PDF format (instantly download-able), works on both Mac and PC. 90 days of professionally planned high-intensity interval, strength, and circuit workouts designed to blast off stubborn fat, get you stronger and increase your athleticism -- I've got all the workouts scheduled out for you day-by-day, week-by-week so you don't have to think about a thing. Detailed workout charts -- I'll tell you exactly what exercises to do, what order to do them in, how fast to do them, how much rest to take, and how many reps and rounds you need to do -- and in how much time. I'm literally your coach, right there with you every step of the way making sure every little detail is covered to make sure you get a great workout every time! Step-by-step instructions with detailed photos that show you exactly how to do each and every exercise -- you'll learn how the smallest tweaks in technique mean the difference between firing the right muscles or NOT. Learning the keys to good form will not only help you get fitter faster, but you'll also be protecting yourself from injury so you can progress safely and accelerate your results. Whether you haven't worked out for a while or even if you're a fitness pro, you get to start the workouts at the level you choose. I'll tell you how to determine which level you're at and get you started with the workouts right away. Dynamic warm-ups -- I'll explain exactly what a "dynamic" warm-up is -- and give you a list of warm ups to choose from. Plus, I'll show you how to create your own warm-ups based on the workout you'll be performing (so you can properly prepare your body) -- that way you don't make the common mistake of doing the same warm-ups over and over again. I'll reveal the 4 key fundamental exercises you MUST do in order to achieve and maintain muscular balance, which is absolutely critical to sculpting your whole body and boosting your power. Without these, you'll never get optimum results or reach your fitness potential. Whether you workout at home or the gym, I'll show you how you can do MAX Workouts with minimal equipment. No fancy, expensive gym machines required. All you need are dumbbells (there's nothing better for functional exercises than free-weights so you can move through full range of motion), a pull-up bar (don't worry if you can't do a pull-up yet, I've got several substitute exercises for you that will work you just as hard until you get there), and I also recommend a barbell (but don't worry, barbells are not required...I've got all the dumbbell variations of my barbell exercises laid out for you, so you're covered either way). Learn how keeping your workouts simple is more effective. I'll reveal why less is more and tell you why doing more can actually work against you -- most people get this all wrong and are left wondering why they aren't getting better results. Cardio interval training workouts -- you already know why long, moderate cardio is a waste of time. However, short, high-intensity interval cardio workouts are a great way to mix cardio into your weight training schedule. You'll get to choose from a long list of cardio interval workouts that work. Think of it as cardio done the right way! How to measure your performance and progress with speed, time, and max strength workouts. I don't just want you to do this program and "hope for the best" -- I want you to train like an athlete and get measurable results. Advanced exercise techniques for all levels -- my easy to follow instructions take the mystery out of the most complex lifting techniques at every stage of the learning process. Even if you think you've mastered these techniques already -- the devil is in the details. My "plateau-proof" training schedule scientifically programmed to keep your body challenged -- so you keep improving your fitness level, increasing your performance, and burning massive amounts of calories. You can stop counting calories because I'm hooking you up with total workouts that will get your heart rate up faster than you can bat an eye -- getting you the results you want, fast. When you buy today, you not only get the MAX Workouts 90-Day Program, you also get all 3 bonuses shown below (a value of $89.85) for FREE! 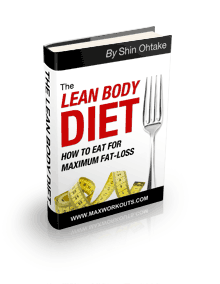 Eat your way to permanent fat-loss and optimal heath with this 90-day rapid fat-loss plan. Learn how to calculate your daily calorie needs (protein, carbs & fat) and choose from an extensive list of healthy, delicious foods. Plus, discover the hidden dangers of processed foods, the one food that will keep you fat (no matter how much you exercise), and learn my secret to curbing late-night cravings. I'll reveal 32 anti-aging and disease-fighting foods, meal plan ideas and my supplement list (I'll tell you about the good ones AND the bad ones). This book is in PDF format (instantly download-able), works on both Mac and PC. Follow this 90-day plan in combination with MAX Workouts for accelerated fat burning and insane muscle definition! Maximize your fat-loss and muscle gain with 16 breakfast, lunch, dinner and snack recipes. 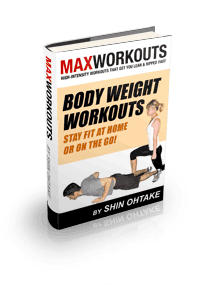 The 4-Week Body Weight Workout Program: Get Fit At Home Or On The Go! Think bodyweight workouts are "too easy"? Think again! Whether you're working out at home or traveling, this 4-week bodyweight workout program will turbo charge your fitness level -- getting you lean & defined without any weights or expensive equipment. This book is in PDF format (instantly download-able), works on both Mac and PC. 12 extreme fat-burning circuit workouts using only your bodyweight -- you'll feel the burn in places you never knew you had muscles! 9 max-intensity interval cardio workouts, which includes 3 sprint workouts, 3 stair workouts and 3 jumprope workouts -- all designed to crank up your metabolism and maximize your calorie burn. Step-by-step exercise photos with detailed instructions for 23 of the most effective bodyweight exercises and combos I know. You don't have to think about a thing -- I've got the 4-week workout schedule all planned out for you. Just follow along and watch your body transform! Do you have nagging pain from an old injury, or, do you sometimes get sore after you workout? 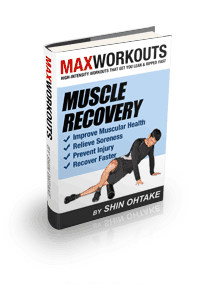 In this book, I'll show you all the little-known "self-massage" techniques using a foam roller to help you drastically reduce pain and soreness -- getting you back to your workouts much faster. These highly effective rehab exercises and stretches will help you rehabilitate old injuries, prevent new ones and recover your muscles so fast you'll be itching for the next workout! This book is in PDF format (instantly download-able), works on both Mac and PC. Please remember, this is a limited-time offer. 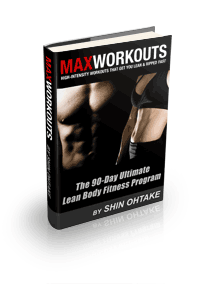 When you buy today, you not only get the MAX Workouts 90-Day Program, you also get all 3 bonuses valued at $89.85 for FREE. During this special offer, you get the entire package for a one-time payment of only $39.95!